Wrap: Organic whole wheat flour, organic unbleached flour, water, non-gmo canola oil, garlic, salt, herbs, spices, cilantro, vinegar. 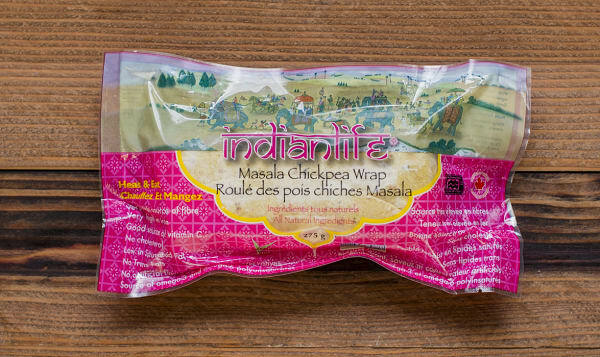 Filling: Organic chick peas, garlic, ginger, tomato, onion, green pepper, red pepper, salt, cilantro, spices, chickpea flour, red chili powder, canola oil, par boiled white rice, wild rice, water, non-gmo canola oil, green onions, pepper, cilantro and spices. If frozen, the shelf life on this product is 6 months. Once thawed, the shelf life is 5 days. Indianlife believes in making your life easy. And what could be easier than a grab and go, delicious lunch or dinner. This wrap, made with organic flours, can be served hot or cold. Perfect for dropping in your lunch box.